New research may help to explain why a vegetarian lifestyle appears to be healthier for the heart than a meat-eating diet. 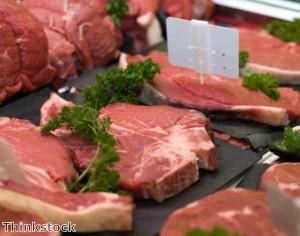 A compound found in red meat may promote hardening of the arteries or 'atherosclerosis', scientists have said. Research conducted at Cleveland Clinic in the US suggests that the compound carnitine is broken down into a metabolite called TMAO in the human gut, which in turn promotes the development of atherosclerosis. The findings, which are published in the journal Nature Medicine, shed light on the reported benefits of vegetarian and vegan diets for the cardiovascular system. "The bacteria living in our digestive tracts are dictated by our long-term dietary patterns," said Dr Stanley Hazen, who led the research team. "A diet high in carnitine actually shifts our gut microbe composition to those that like carnitine, making meat eaters even more susceptible to forming TMAO and its artery-clogging effects." The expert added that in contrast, vegetarians and vegans have a reduced capacity to form TMAO from carnitine, which he believes "may explain the cardiovascular health benefits of these diets". Carnitine is also found in many popular energy drinks, which means that these products may also promote the growth of gastrointestinal bacteria that break the compound down into artery-clogging TMAO. It may therefore be necessary to examine the safety of carnitine supplementation as, under some conditions, it could increase the risk of atherosclerosis, Dr Hazen suggested. The findings indicate that people who regularly use carnitine-enriched energy drinks may want to consider an alternative way of combating tiredness and gaining more energy and vitality. One way to avoid excessive carnitine production from eating meat products could be to use a food supplement such as Klamath Blue Green Algae, a nutrient-dense greenfood that supports optimum health and vitality. Importantly for those who choose not to eat meat, Klamath Blue Green Algae is a rich source of vegan protein, containing 60 per cent high-quality protein. Grown in the wild in Upper Klamath Lake in the US, this organic product is thought to provide a range of health benefits and would make a useful addition to any healthy nutritional regime, including vegetarian and vegan lifestyles.